That denizen of Nevada brothels, Sean “bad for America” Hannity likes to refer to his close relationship to Agent Orange, but freaked out when listed as one of the two media people POTUS45* uses for close advice. It depends whether Sean gets a subpoena because of the social networks of #TrumpRussia and FBI/NSA surveillance on its players. The article went on to say, “Presidents always deploy surrogates to appear on television to spout their talking points, but Mr. Trump has expanded on that by developing relationships with sympathetic media figures like Mr. Hannity who also serve as advisers. 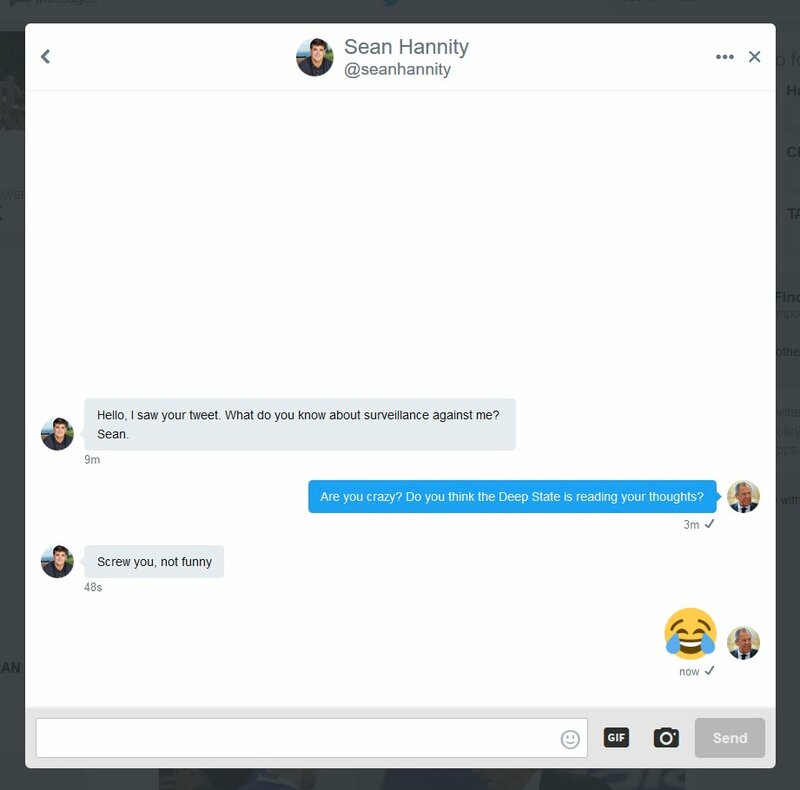 This apparently sent Hannity into a rage. 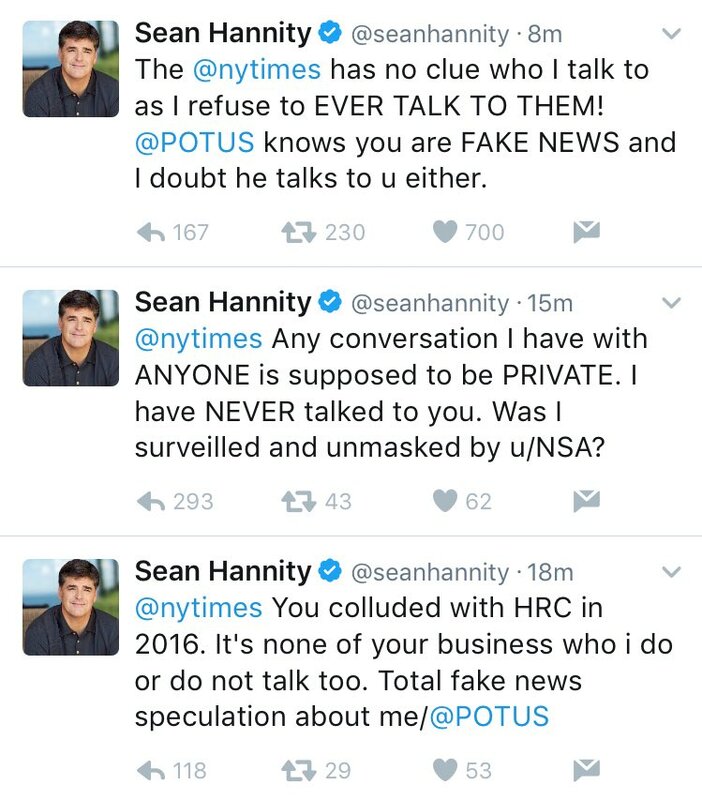 Times reporter Maggie Haberman responded that Hannity’s heated reaction is kind of bewildering given the anodyne nature of the article. 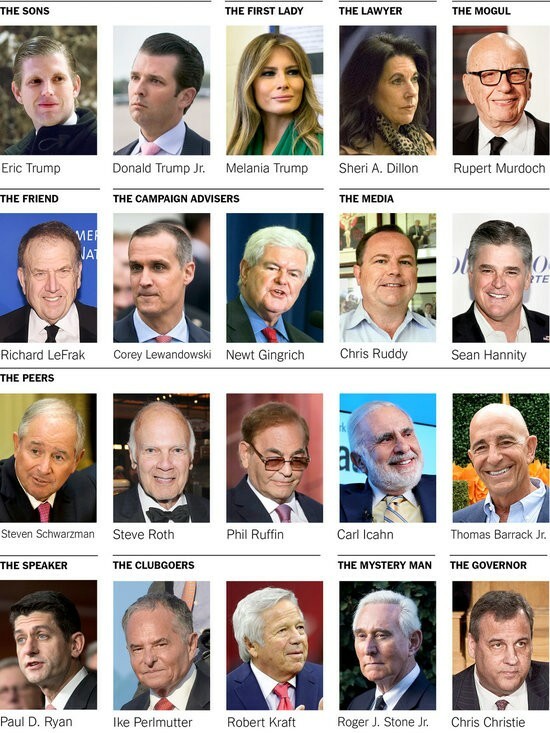 We now know a bit more about who colluded with whom in the matter of the 2016 election …. “Should you consider what you’re about to do may help elect Donald Trump president?” an adviser asked him, Mr. Comey recalled recently at a closed meeting with F.B.I. agents. He could not let politics affect his decision, he replied. “If we ever start considering who might be affected, and in what way, by what we do, we’re done,” he told the agents…. But with polls showing Mrs. Clinton holding a comfortable lead, Mr. Comey ended up plunging the F.B.I. into the molten center of a bitter election. Fearing the backlash that would come if it were revealed after the election that the F.B.I. had been investigating the next president and had kept it a secret, Mr. Comey sent a letter informing Congress that the case was reopened. 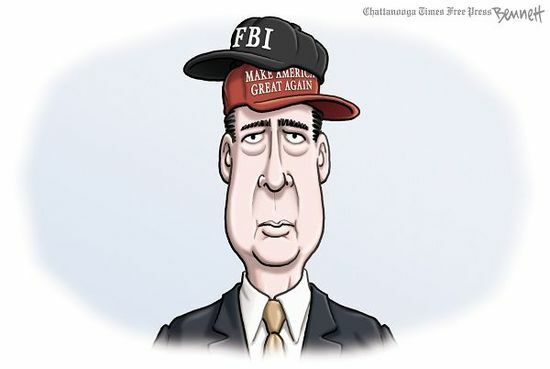 What he did not say was that the F.B.I. 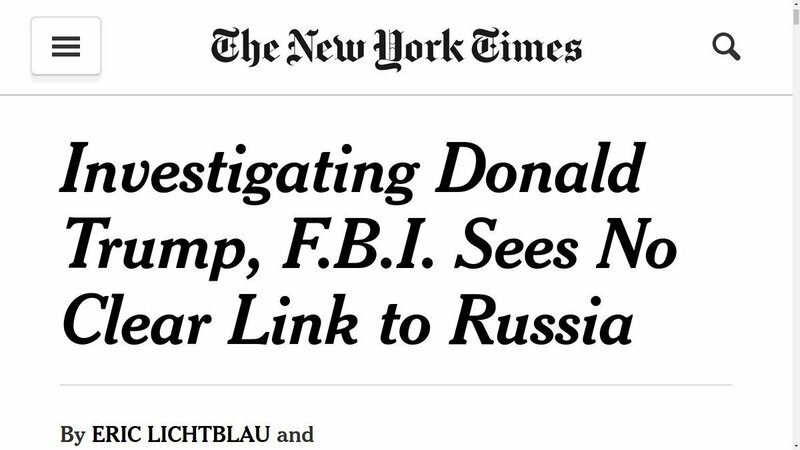 was also investigating the campaign of Donald J. Trump. Just weeks before, Mr. Comey had declined to answer a question from Congress about whether there was such an investigation. Only in March, long after the election, did Mr. Comey confirm that there was one. For Mr. Comey, keeping the F.B.I. out of politics is such a preoccupation that he once said he would never play basketball with President Barack Obama because of the appearance of being chummy with the man who appointed him. But in the final months of the presidential campaign, the leader of the nation’s pre-eminent law enforcement agency shaped the contours, if not the outcome, of the presidential race by his handling of the Clinton and Trump-related investigations. This entry was posted in 2016 Election, Barack Obama, Conspiracy, Fascists/Corporatists, Government, History, Media, Political Science, Politics, Presidential Elections, Propaganda, Society and tagged Conspiracy Theories, Donald Trump, Media, New York Times, Politics, Sean Hannity, trumprussia. Bookmark the permalink. Much like Jeff sessions, when he was questioned by Senator Franken, both seem to blurt out very defensive statements beyond what was asked by their person asking the question. Sessions said he had not spoken with the Russians, which was not what was asked of him and Hannity says he is not an advisor, even though *45 says he is one of his sources of advice. If Sessions said what he said as a guilt-ridden cover, Hannity may have done the same. I am sure the FBI has cause to look into all of these somewhat interwoven webs of lies and deceit. They will connect the dots, but as many as their are, it will take time. That is unless the small fish turn first to save their skins. I ask how go the investigation into the un-American activities of the alt-right press, perhaps including faux news with the rest of the slime-covered outlets already named as targets by the investigators. Yes, then they should be subject to the rules where they get a chance before the committee to earn that title. Or not. Being named as an “advisor” blows his cover as an “entertainer” right out of the water. To date, when called to account, he has whined that he is just an entertainer. Presidential advisors must have a certain gravitas and credibility. Or at least, they used to. Alex Jones had to admit in court this week that his whole shtick is an act. All fake, for entertainment. Being forced to admit he is a professional liar in his custody case probably did not make him look very good to the judge. Moral character is important when awarding custody of kids. No less should be expected of WH advisors. Ever wish you were able to be a fly on the wall? Kushner is such an arrogant little prick. He interrupted McMasters once and I thought the General was going to strangle him. Well, he is a Secretary you know…..